How Do You Spell Imagination? 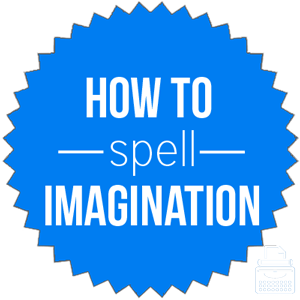 Home » Spelling Dictionary » How Do You Spell Imagination? Spelling of imagination: imagination is spelled i-m-a-g-i-n-a-t-i-o-n. Take care as the t sounds like sh when said out loud. Definition of imagination: The ability to creatively form ideas, images, or sensations within the mind. Pronunciation of imagination: Imagination is pronounced i-ma-gin-a-shun. Using the word in its most literal sense, imagination is used to form mental images of things that are not present to the senses. Use your imagination to picture a world where everything is made of chocolate. This novel is boring and the writer lacks imagination. It has captured my imagination: Can be used to describe a general interest in something. It sparked my imagination: This phase refers to something that has given someone an idea or creative impulse. The abstract noun imagination incorporates a wide range of ideas and meanings. The following list should therefore be treated as a list of associated words rather than direct synonyms. Imagination is an abstract noun and refers to person’s ability to create an image, a thought, or a concept in their mind.